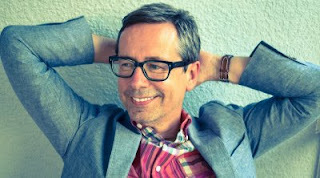 Nick Heyward has unveiled his first single in eighteen years, the double A-side ‘Mountaintop’ and ‘Baby Blue Sky’. The single is the first offering from his solo album ‘Woodland Echoes’, which was released last Friday (August 4). A-side ‘Mountaintop’ is inspired by a poignant mountaintop scene in Sam Wood’s 1939 film ‘Goodbye, Mr Chips’, but was written at sea-level and infused with his love for the rootsy sound of Americana. The infectiously sunshine-infused 'Baby Blue Sky' is inspired by living and recording on a houseboat in Key West. Featuring ABC guitarist Matt Backer on guitars. Nick describes working with him as a chance to "express their mutual love of the Rubinoos, Big Star and 70’s guitar power pop." The accompanying video for ‘Baby Blue Sky’ was filmed entirely on Nick and his fiancee's mobile phones. Featuring footage of Nick's American band, it gives us a snapshot of his life in Key West, where he recorded much of the album. "I love the sense of freedom" Nick enthuses, "here we are in 2017 and we can make a video ourselves on our phone and edit it on our computer. I loved the whole process and the lack of rules or formulas." Trained as a commercial artist, Nick's eye for framing an image means he has not only shot much of the video, he has also captured the aesthetic behind the album and single artworks. His recent solo set at this year’s Great Escape Festival - praised by Drowned in Sound as “one of the finest we heard all weekend, his second coming is imminent” - was just a taste of his upcoming full band headline shows. Nick’s return to the music scene and to the live circuit has already seen support across the board from the likes of Classic Pop magazine and Record Collector, while the single already picked up plays on BBC Radio 2 from Vanessa Feltz, whilst BBC London’s Gary Crowley made ‘Baby Blue Sky’ his ‘Record of the Week’. Nick Heyward might just be back from a long hiatus, but 'Mountaintop' and ‘Baby Blue Sky’ look to firmly consolidate his songwriting credentials among the greatest, and with a brand-new album ready for pre-order through the direct-to-fan platform PledgeMusic and a tour in Autumn, he is here to stay.